Blog » The Fantastic Family » Interesting Facts About Our Services! Interesting Facts About Our Services! It’s always fun learning new things! It was even more interesting while we collected these facts about the services that we provide. 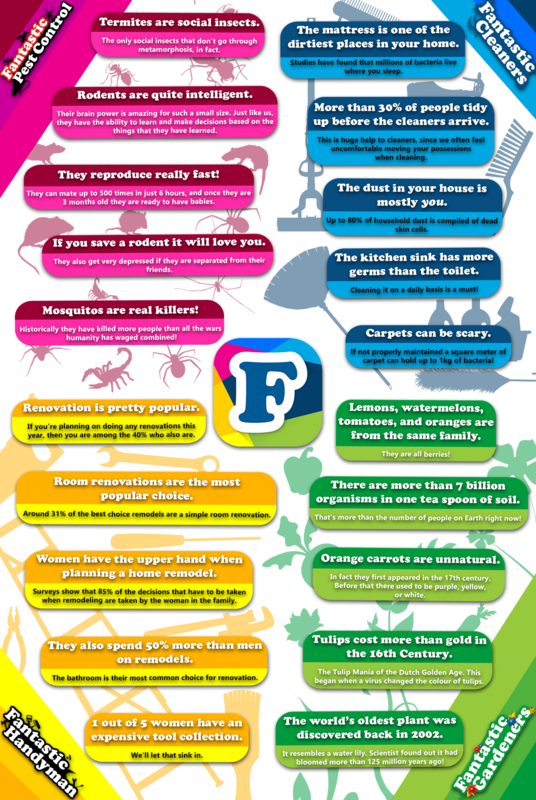 You’ll be amazed by some of the things that we have featured in our infographic! The only social insects that don’t go through metamorphosis, in fact. Their brain power is amazing for such a small size. Just like us, they have the ability to learn and make decisions based on the things that they have learned. They can mate up to 500 times in just 6 hours, and once they are 3 months old they are ready to have babies. Studies have found that millions of bacteria live where you sleep! This is a huge help to cleaners since we often feel uncomfortable moving your possessions when cleaning. Up to 80% of household dust is compiled of dead skin cells. Cleaning it on a daily basis is a must! If not properly maintained a square meter of carpet can hold up to 1kg of bacteria. If you’re planning on doing any renovations this year, then you are among the 40% who also are. Around 31% of the best choice remodels is a simple room renovation. Women have the upper hand when planning a home remodel. Surveys show that 85% of the decisions that have to be taken when remodelling is taken by the woman in the family. They also spend 50% more than men on remodels. the bathroom is their most common choice for renovation. One out of Five women have an expensive tool collection. Lemons, watermelons, tomatoes, and oranges are from the same family. There are more than 7 billion organisms in one tea spoon of soil. That’s more than the number of people on Earth right now! In fact, they first appeared in the 17th century. Before they used to be purple, yellow or white. Tulips cost more than gold in the 16-th century. The Tulip Mania of the Dutch Golden Age. This began when a virus changed the colour of tulips. The world’s oldest plant was discovered back in 2002. It resembles a water lily. Scientist found out that it had bloomed more than 125 million years ago!